Hi friends! I hope you're having a beautiful day! We are so-so. Avery has some sort of virus that's running its' course through her system and causing her lungs to swell so she has to be on a nebulizer for a while. I'm hoping it clears up quickly. Anyone who's dealt with respiratory issues knows how scary it can be. Brady's also getting over some sort of virus but he seems to be fairing much better. Here are a couple more projects I did for Teacher Appreciation Week. They are super simple small things. I just wanted to send little tokens of appreciation everyday. 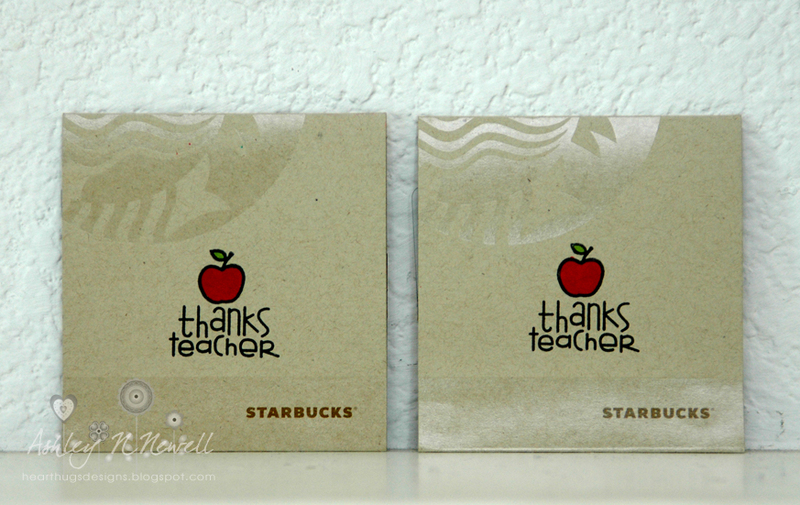 I used to work in education so I really appreciate what teachers do for their students. I had one for everyday but forgot to photograph the one I sent on Thurs. It was M&Ms with a poem about teachers. 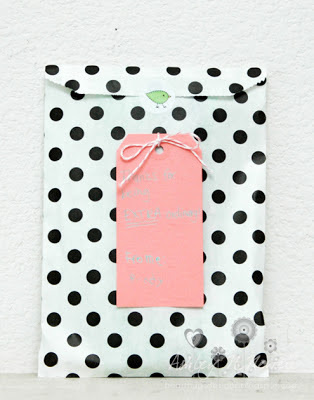 This first one is just a 3 pack of Extra gum in a Polka Dot Bitty Bag with a Chick Sticker to seal it. 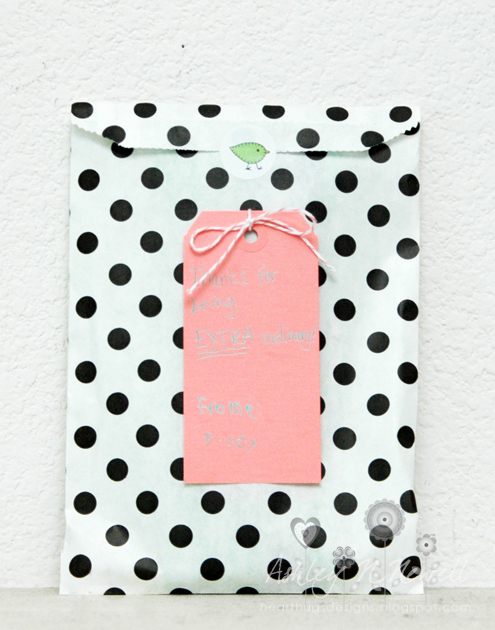 I used a Colored Tag with a bit of Divine Twine to write the sentiment "Thanks for being EXTRA-ordinary!" then I had Brady sign it. I wanted to use a bunch of great free printables I found on Pinterest but my printer is out of ink so I had to go with what I had. Here's an idea I got off Pinterest. I found these fun reusable jars and filled them with those little packets you put into a bottle of water to flavor it. I added some May Arts ribbon and added a tag that says "Thanks for helping me find my creative JUICES!" I stamped the crayon and pencil with some Paper Smooches stamps. On the last day, I sent these gift cards. My friend Latisha posted a picture on her Facebook where she stamped directly on the gift card holder. Hers is MUCH nicer but I was on a time crunch. You can see Latisha's project HERE. I used some Paper Smooches stamps for this and some Copics to color them. 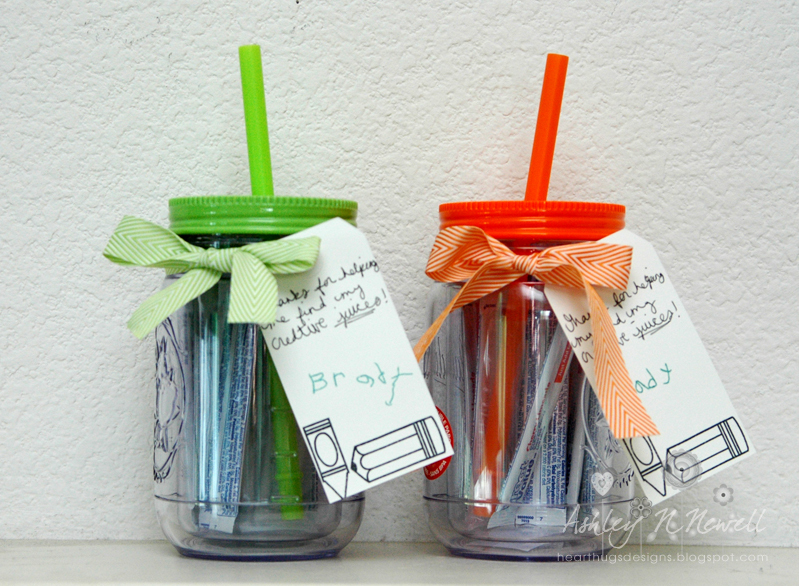 Great teacher's day gifts. Love pinterest for wonderful ideas-we used one this year and made body scrubs in different scents. Hope the teachers like them. These are great! So impressed that you sent something everyday, you are so sweet!